Editor’s Note: Years after the game’s original release and our review on Xbox 360, this piece has been updated following the release of the game on Nintendo Switch, as well as the content updates that is available to all which reflects on the overall score, and final verdict. 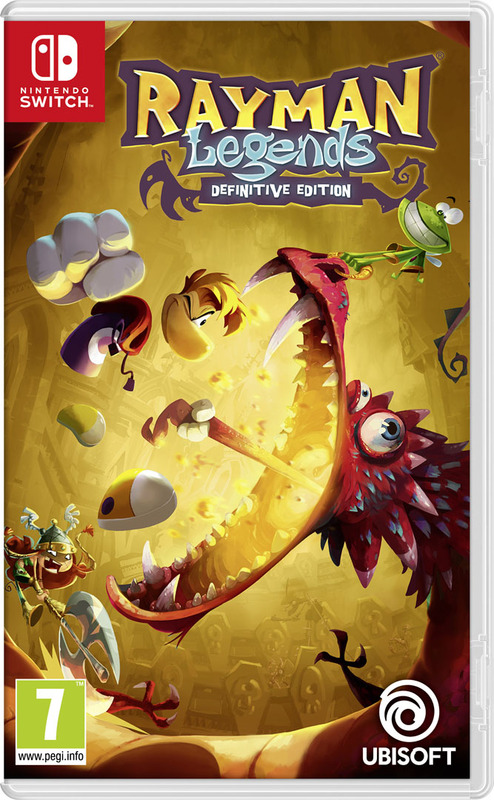 Released in 2013 on Xbox 360, PlayStation 3 and Nintendo Wii U, Rayman Legends doesn’t bring any sort of wrinkles in 2017, after a re-release of the game on Nintendo Switch dubbed Rayman Legends: Definitive Edition. An amazing 2D platform game, Rayman Legends: Definitive Edition is the kind of title that will stay on your Nintendo Switch for a long time, full of diversity, flair, humor but mostly challenges. For those of you that probably played the game, this “Definitive” edition shouldn’t mean much, as nothing truly was added to the game from the previous generation releases. More of a compilation of all features than anything, the game brings all characters that were specific to each platforms (such as Rayman Mario), but tries to expand by adding a tournament mode for the very fun Kung Foot. In any case it presents no novelty which justifies buying in on another platform, unless you missed this amazing game in the past and got a brand new Nintendo Switch. In any case, if you want our proper verdict of the game, you can read the original review below published back in August 2013. The first thing that strikes by loading Rayman Legends for the first time, is the special care given to the world and the soundscape. Origins had set a very high bar in terms of graphics and soundtrack, this second installment pushes the limits even further. Whether at the level of textures, lighting and animations, this episode is a pure delight for the eyes. The music is still engaging and sticks perfectly to the atmosphere of the game, and everything is designed to make you live an immersive experience and get the maximum pleasure; one that will drown you in over 120 different levels (split into five worlds and a secret one), each as impressive as the other. All of this is a standing ovation of the work done by Michel Ancel and his team, giving us a richer and sharper Rayman from last year’s Origins. With the typical or “classical” platforming levels that sees you save ten Teensies, while grabbing as many Lums as possible, you will have the go through engaging speed courses, challenging bosses, and will need to save princesses in special chapters as well as musicals (Check the video below). The latter brings forward all your sense of coordination, your knowledge of immortal music hits (Eye of the Tiger, Black Betty), which you can see an example in the video below. Of course let’s not forget the “Invaded” levels, which appear gradually as you progress throughout the story, which act as a sort of time attack mode, where you have to break the best set time to save either one, two or the three Teensies. Obviously, creatures, traps and all kind of obstacle will complicate your task, but it pays off, as you can publish your time on the world ranking. The concept of the whole game is simple, and close to Rayman Origins: each world (or painting) unlocks as you rescue Teensies (700 in total). The number of Lums (the game’s “currency”) you collect also has its own level of importance since it allows you to get new characters and receive scratch cards . Yes, there’s a hell lot of things to collect, and will take you easily over 80 hours of gameplay to complete. While this mechanical progress has been used before, there’s a sort of nicer way to present it. Some players may well feel a kind of Déjà vu, especially the structure of each world: classic levels, speed runs, boss and finally a musical level. That said, nothing prevents you to browse the levels in the order you desire, and the scratch cards can also provide access to “Back to Origins” levels, a collection of some of the best levels found in Rayman Origins. Those never played Origins will be happy to discover the essence of fun found in the previous installment, especially the Wii U users (who even got more features such as Mario & Luigi skins for Rayman and Globox and various touch features in the game). The highlight of the Rayman Legends, is its obvious asymmetric gameplay. On the Wii U (and the upcoming PS Vita version), some lvels have been designed to highlight the touch features. If you play alone, you take control of Murphy at specific times, with the AI controlling its movement, and using specific buttons to make use of his actions: move or tilt platforms, activate switches, tickle the enemies to make them vulnerable, etc. (check the video above to have a clearer image). But on the multiplayer mode, although it is essentially the same, the player holding the Wii U GamePad will control Murphy to do all these actions (similar as Super Mario Bros. U). A feature that proves valuable, practicality and makes the levels easier when you play with people. In addition to offering an offline adventure of exemplary quality, Rayman Legends has the luxury of integrating an online mode. These are based on daily and weekly challenges, with different goals and difficulties. At the time of writing, I tried a challenge which asked me to collect 150 Lums in a minimum of time. Again, it will show work your dexterity and memory to remember their location and collect them in the most efficient way. Very friendly and super addictive, the Challenge mode provides a competitive scoring system via leaderboard, which expands furthermore with Kung Foot mode (a football game where you bash a ball to score). Rayman Legends was reviewed using an Xbox 360 and Nintendo Switch downloadable code of the game provided by Ubisoft Middle East. The game is also available on PlayStation 4, Xbox One, PlayStation 3, Nintendo Switch and PlayStation Vita. We don’t discuss review scores with publishers or developers prior to the review being published (click here for more information about our review policy). Even more beautiful and certainly more dynamic than Origins, Rayman Legends is the confirmation that Michel Ancel is the master of platforming games for the past decades. Despite a tendency to recycle couple of features, the artistic tone and the immersion level that Ubisoft Montpellier brings, makes this game a visual and fun treat exceeding our expectations. Origins had laid an excellent foundation, and Legends validates it is certainly not the end for the franchise, a surprise that will please everyone, all ages, especially in an era lacking of originality, and overuse of sequels.